Built originally in the 12th century, today we see the remains of an impressive 15th century castle built by Sir William ap Thomas and his son William Herbert, remodelled by William Somerset, third Earl of Worcester, 1549-89. It is likely that the early castle followed the motte-and-bailey design of most castles of this period and location and some traces of this early history can still be seen. 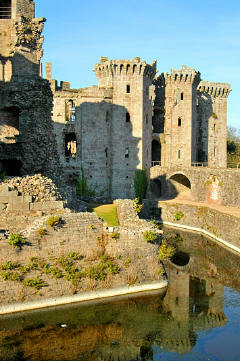 The present castle was begun in 1435 for Sir William ap Thomas, who married the Raglan heiress Elizabeth Bloet in 1406. Upon his death his son, William Herbert, continued the work. Records don't make it clear which of them built the Great Tower, the most prominent feature of the present site. William ap Thomas fought with King Henry V at the Battle of Agincourt in 1415. In 1426, ap Thomas was knighted by Henry VI, becoming known to his compatriots as "the blue knight of Gwent." Sir William Herbert, Earl of Pembroke, was the next owner of the castle, and it is Herbert who is responsible for Raglan's distinctive Tudor-styling. Both William ap Thomas and William Herbert fought in France, and the castles that they saw while in France is thought to have influenced the design of Raglan. 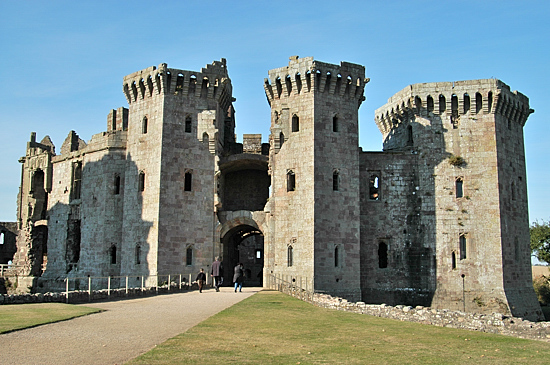 The elaborately decorated polygonal keep, as well as the double-drawbridge arrangement of the keep, unique in Britain, demonstrate the French influence. The castle was the boyhood home of Henry Tudor, later King Henry VII, who was placed in the custody of William Herbert during the War of the Roses. One account says that in 1492, Elizabeth Herbert married Sir Charles Somerset, a natural son of Henry Beaufort, third Duke of Somerset, and it is to the Somerset family as Earls of Worcester that we owe the final architectural touches of the castle. While another puts this later as in the later 16th century, the castle was re-fashioned into a grandiose and luxurious mansion by the Somerset's, Earls, and later Marquesses of Worcester, who inherited the manor of Raglan through marriage. The peak of the power and splendour of the castle was attained in the 15th century and 16th century, as the Marches fortress of the great family of Herbert. Despite demolition attempts the end of one of the longest sieges of the English Civil War much of the hexagonal-shaped Great Tower and lavish suites of state apartments still survive. Some of the great tower was damaged by mining as a part of the slighting process. Throughout the 18th and 19th century's, the castle was a picturesque ruin, and a convenient source of building materials for the local population. In the 20th century, the Dukes of Beaufort, the Marquesses of Worcester having been elevated yet again, placed the castle in the care of the state. It is presently administered by Cadw. The main part of the castle is very roughly rectangular, with the hall range in the centre, and courtyards to either side, each of them surrounded by towers and sets of apartments. The Great Tower, or the 'Yellow Tower of Gwent', built as the enclave for the castellan's family, stands in a moat, separate from the rest of the building, to which it was connected by a drawbridge. Entry to the castle is through the White Gate (16th century), of which little remains. Originally, this was preceded by the Red Gate, now totally destroyed. 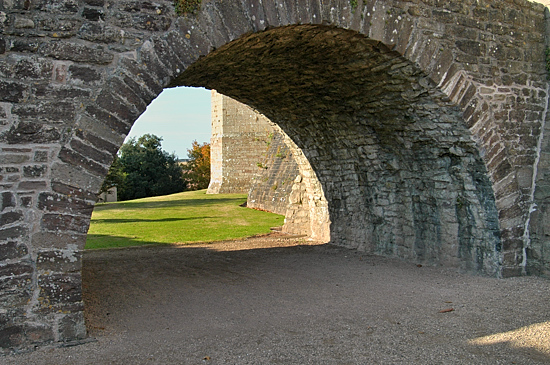 Crossing a bridge, through the monumental Gatehouse, one enters the Pitched Stone Court, the earliest range now extant, built, circa 1460, in the time of Sir William Herbert. The Service Range, to the right and ending in the Kitchen Tower, is now almost completely ruined and only the foundations indicate the extent of the original court. To the left is the surviving wall of the Great Hall, with an oriole window. Above ran the Chapel and the Long Gallery, fireplaces of which can still be seen. Through the Hall, one enters the Fountain Court, so named for the fountain statue of a white horse, of which only the plinth remains. All around, relicts of sumptuous apartments built in the Elizabethan reconstruction. 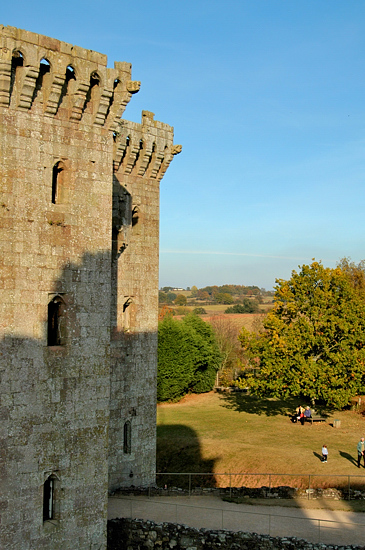 The castle commands extensive views over the surrounding countryside. 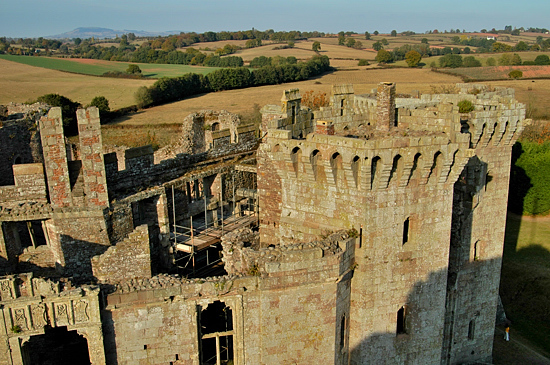 Visiting Raglan Castle today you will be impressed by its size, quality and what remains, once you see the area that it once occupied and the parts that no longer are as clear, you will see how influential this castle would have been when built. a gallery is available for this castle, which links back to this page. Toilets, guidebook available, on-site shop, site exhibition. A variety of lenses, including wide angle if you have it. 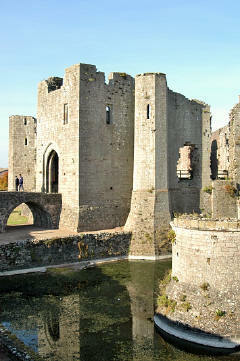 CADW and English Heritage members (1YR plus) free, English Heritage members fist year 50%. Entry is FREE for Welsh residents aged 60 and over or 16 and under who have a valid pass. Special Needs Access: Ground floor accessible as is access to exterior views, routes up towers and along walls may be unsuitable for some. Please let us know any other information that we can add to the Further information and Planning Grids or page and any errors that you discover. Before making a long trip to any location it is always wise to double check the current information, websites like magazines may be correct at the time the information is written, but things change and it is of course impossible to double check all entries on a regular basis. If you have any good photographs that you feel would improve the illustration of this page then please let us have copies. In referring to this page it is helpful if you quote both the Page Ref and Classification from the Grids above. To print the planning grid select it then right click and print the selected area.